Clifford the Big Red Dog is a familiar character to most, and is famous enough to have his own TV show on PBS Kids. He has a friendly, outgoing, and generally helpful attitude 80% of the time. The remaining 20% consists of an impish propensity for involvement in mischievous indiscretions. What most people don't know is that Clifford's appearance, attitude, and "Yes, this disaster happened but it's not my fault" approach to life is based on the Vizsla - a pointing dog breed of Hungarian descent that many (even within the dog-owning community) have never heard of. In 2009, the Vizsla ranked 42nd on the AKC's list of popular breeds, below Red Blooded Coonhounds but well ahead of Bluetick Coonhounds (all of which blew the Chinese Shar-Pei out of the water at a disappointing 47th). As a public service, I hereby offer up a short Q&A tutorial on the proper way to interact with the Vizsla, and the socially peculiar and idiosyncratic Vizsla Owner. Q: I lost my copy of Hooked on Hungarian Phonics®, can you tell me how to pronounce the word "Vizsla"? A: Certainly. The close proximity of the "Z" and the "S" will easily overwhelm the unprepared mind, so pay close attention. Misuse of the term will forever brand you as a blabbering ignoramus, while a crisp delivery is sure to elevate your social status immediately. Q: What happens if I refer to a Vizsla as a "VISH-Luh" when addressing a member of this stately breed? A: If you commit such a careless faux pas, the Vizsla will look upon you as an aberration of nature, having correctly identified you as an intellectual inferior. Q: How will the Vizsla Owner react to a similar mispronunciation? A: Imagine showing up to an exhibitionist dinner gala with a festering case of the crusted Norwegian scabies. No amount of salve after-the-fact will truly erase such a breach of social etiquette. Having slighted the entire Hungarian/Magyar heritage in this process, anyone within ear shot will thereafter snub your wretchedness. Q: How do I avoid these potentially ruinous consequences? A: Practice the correct pronunciation in private well in advance of contact with your Vizsla or Vizsla Owner. This will result in what scientists refer to as "tongue memory," which will help ensure a culturally accurate delivery under pressure. "I can't help but notice that your VEESH-Luh is making off with my dinner jacket. Adorable!" Such an approach will invariably identify you as a mature, sophisticated, and highly intelligent canine connoisseur. A successful delivery may eventually open doors you never before thought possible. 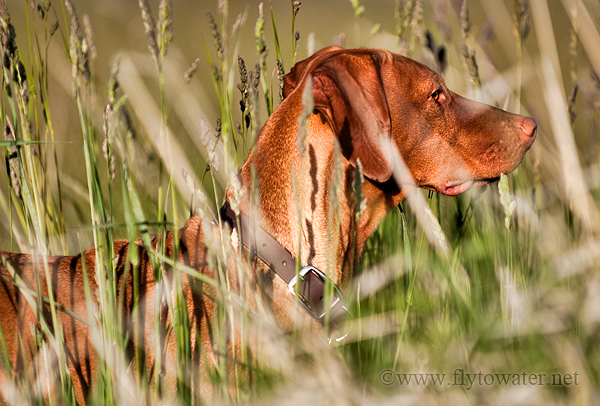 Having completed this Q & A session, you are now ready for additional exposure to the Vizsla. Feel free to use the remaining images in this post as partners in your role playing. 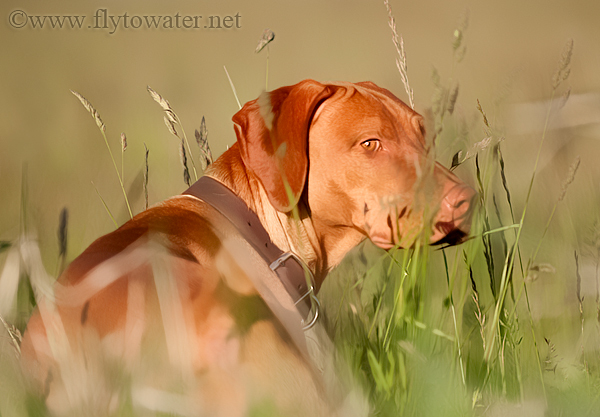 The last few weeks I've taken a fishing hiatus to spend some time in the field with Dusty, my 1-year-old Vizsla pup. He is a double handful at this stage, but is extremely biddable, eager to please, and affectionate - which is typical of the breed. 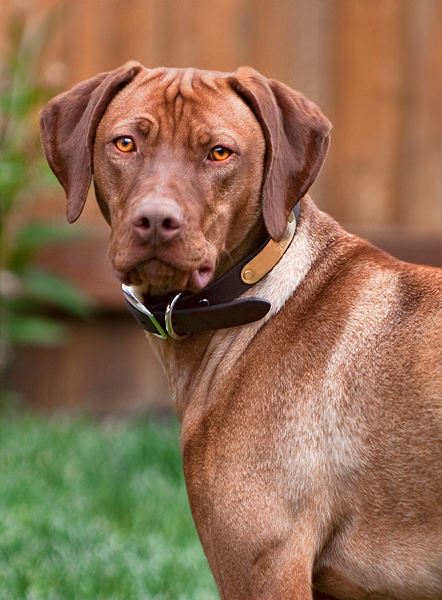 If you're in the Utah area and are interested in a Vizsla down the road, contact Josh McPherson of Hillbillie Vizslas. Pups from his litters are among the best anywhere. 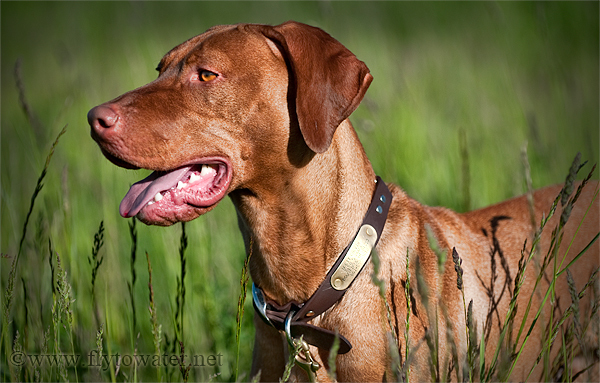 Gun Dog Breeders is also a good source of Vizsla breeders nationwide. 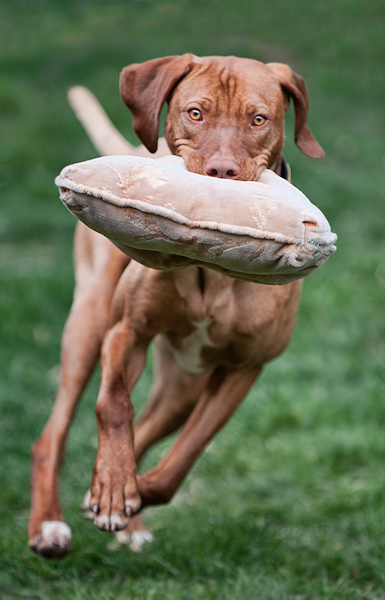 If you would like to learn more about the history, standards, and what to expect when owning a Big Red Dog, Marion Coffman's book Versatile Vizsla is a great place to start. Great post and Beautiful Pup Brett. We may need to get out this fall and do some "training" on some 'chucks. Thanks Kyle. He's showing a lot of potential, and I've already got chuck-chuck on the mind. Awesome PICS... and a very interesting read. Can't wait to see some hunting pics! I'm really glad you liked the shots Lucas. I'm looking forward to some feather finding myself. Creative, entertaining and informative posting Brett. I have two Vs myself, a mother & son; see www.EdisoniaVizslas.com. Sal - I enjoyed looking through your web page. Luna is a looker - beautiful coat color. Thanks for the comment & link!